Scholarship recipients express thanks to the Miller Family representatives via Skype. Front L to R: Mikael Nalbandyan, Hovsep Ananikyan, Hermine Grigoryan, Shoghik Tatevosyan, Seda Popova, Armine Tonoyan, Hambartsum Sanosyan, Mariam Petrosyan, Araksya Harutyunyan, Irina Lazarian, executive director of Armenia Fund USA. Yet Hermine may have missed the opportunity to discover her professional calling if not for the financial support she receives as a recipient of the Norman Miller Scholarship Fund. It was established in 2009 as an endowment by the family of the late Norman Miller. 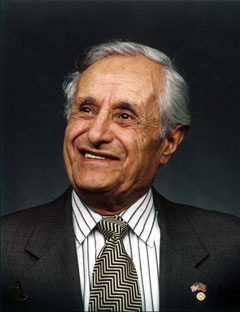 A highly successful engineer, inventor, businesman, American citizen, Armenian patriot and philanthropist, Norman Miller understood that the driving force behind his success was his education. Born in Turkey on the cusp of the 1915 Armenian genocide, Norman Miller had the quintessential American success story. It was built on hard work and the opportunities that came his way to propell him to achievement. Near the time of his passing in 2009, at the age of 94, Mr. Miller was convinced that the best way to give back to his homeland was to create educational opportunities for young engineers with the talent, drive and ambition to make a productive difference. Hermine, one of the 10 recipients of this year’s scholarships, earned her place at one of Armenia’s best engineering learning centers on the basis of academic excellence and financial need. Today, she can focus on her studies, without the worries of paying for tuition, books and other expenses covered by her scholarship award. Yet, not all of these young scholars have chosen such an obvious path as IT. This bodes well for the future of the nation, as a more well-rounded cadre of engineers is prepared to fuel the economic engine. For example, Michael Nalbandyan is currently working toward a graduate degree in Textile Products Design and Development at the State Engineering University of Armenia (Polytechnic), Gyumri branch. He recalled how it started. “Prior to this, I received my bachelor’s degree in Engineering. During that time, I had the honor to participate in a scientific conference; I presented my article about technology and the textile industry. This article was later published. Soon after my graduation, I was called to serve in the army. Upon my return, I received a lot of support and encouragement from my parents and professor to continue my studies. But having to work and attend classes, I realized that it was hard to keep my grades up.” Today, Michael no longer has to compromise, thanks to the financial support he receives as a Norman Miller scholar. In a meeting with Irina Lazarian, the executive director of Armenia Fund USA, the scholars had the rare opporotunity to communicate directly with members of the Miller family via a Skype videoconference. Norman Miller’s daughter Florence Miller-Mohler and granddaughter Julia Miller spoke to them from the U.S. Such sincere sentiments of gratitude were seconded by the rest of the group in attendance, including scholarship recipients Mariam Petrosyan, Vardan Bagaryan, Araksya Harutyunyan, and Armine Tonoyan. Irina Lazarian, who also holds an advanced engineering degree in Computer Sciences from Yerevan State Engineering University and an Industrial Engineering Master degree from American University of Armenia, concurred with the sentiment. “It is important to live up to Norman Miller’s own dream: that, one day, you too will be in a position to help those following in your footsteps. Like you, they can also rise higher. That is how we build a nation built to last,” she concluded. 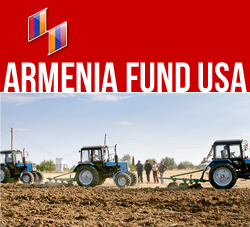 ARMENIA FUND USA: founded in 1992, was one of the first of “Hayastan” All-Armenian Fund’s 20 international affiliates and serves constituents in all states east of the Mississippi. As a non-profit, non-governmental, nonsectarian organization, the Fund represents all Armenian constituents, supporting strategic infrastructure projects in Armenia and Karabakh. The Fund has adopted a policy to go “Beyond Bricks and Mortar” to provide sustainability for projects it sponsors.